Details: 30% off everything in the store (except Pandora Jewelry), 40 vendors in the outdoor courtyard, live entertainment, food and drinks available for purchase at the Reef Cafe, door prizes! More Info: Check out their website, Facebook and Instagram accounts for more info! Details: Lots of great shops in Paia are offering discounts, many listed on the PaiaMaui.com website (click on date and scroll to bottom) – also 10% kama’aina discount (friday, saturday and sunday) at Maui Crafts Guild. 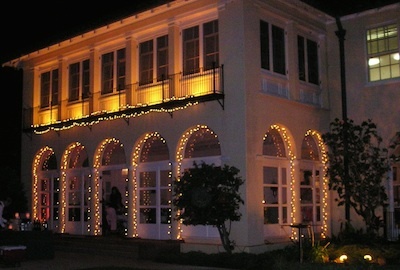 Details: Shop for exclusive treasures by local artists and vendors and enjoy spirited music and festive drinks and pupu while surrounded by holiday décor of the historic Kaluanui Estate. Also includes the unveiling of designer/choreographer André Morissette’s imaginative “holiday window” installations. Details: Parents and local vendors will offer lovely hand-made wreaths, wildly popular home-baked goodies, jams and jellies, jewelry, clothing and other specialty items perfect for gift-giving and adding holiday cheer to your home. Highlights of the event are a special storytelling presentation by On the Wing Storytelling at 3:30 p.m. and a performance by the Suzuki Maui Violin Youth Ensemble at 4:15 p.m. Interested vendors may contact ptomontessori@gmail.com. Cost: Admission is free and open to the public. Details: 75 of Maui’s best artisans, live entertainment, kids crafts, puppet show, games and more! 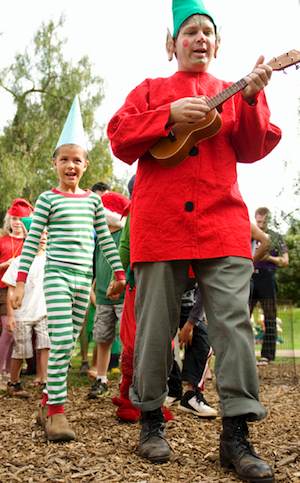 Elf Parade at 10AM, every child dressed as Santa’s helper gets a FREE gift! Details: (awaiting confirmation but I believe this is the schedule- or contact info below to confirm before you go) On Saturday, live music and holiday craft fair starts at 10am. Keiki activities kick off at 2pm with the arrival of Santa at the North Pole, cookie decorating, face painting and Christmas crafts. Da Hawaiian Snowman ice sculpture is arriving at 4pm, donated and carved on site by Lahaina Ice Company. 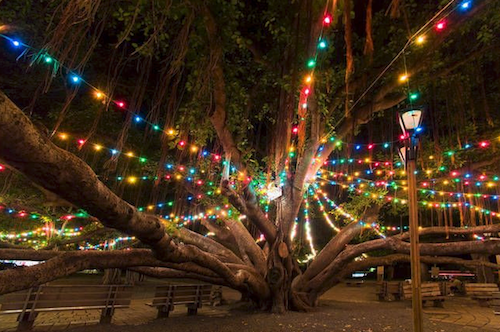 TREE LIGHTING is 6:30pm Saturday, with live music by Lahainaluna HS Band (Tree stays lit for entire holiday season December 6th-to January 2nd, 2015). 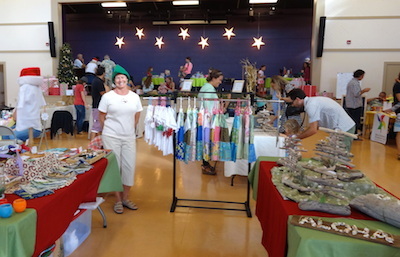 Holiday arts and crafts fair and live music continues Sunday at 9am . Admission: Free, however the LahainaTown Action Committee requests one canned or non perishable food item for admission to the “North Pole” winter wonderland. 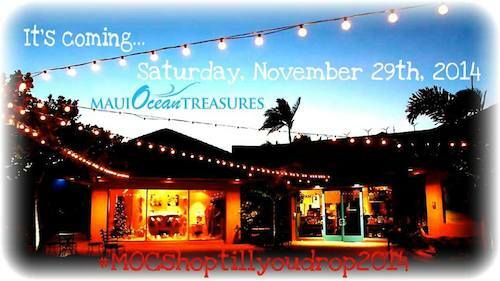 Details: Showcasing Maui’s Mom-owned businesses – handmade gift items perfect for Christmas, baked goods, jewelry and more! Details: Tree lighting, caroling, holiday crafts for kids, treats, sparkling wine toast, and outdoor movie showing of POLAR EXPRESS! 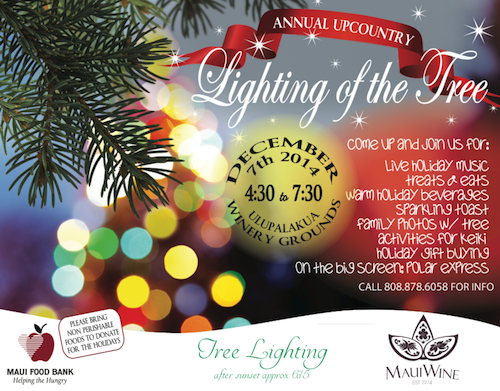 This tree lighting ceremony is in honor of Ulupalakua’s 150 years of commitment to our island’s land and the never-ending forestation efforts, including the replanting that follows tropical storm Iselle’s destruction earlier this year. Details: For the first time ever on Maui – 20 local and international nonprofits offer an opportunity to buy ‘gifts’ (such as buying a goat for a family in Africa in the friend’s name), by making a donation on their behalf, a receive a card for under their tree!! Do good and feel good! Charities will include: Maui Food Bank, Aloha House, Hospice Maui, Women Helping Women, Friends of the Children’s Justice Center, Maui AIDS Foundation, Maui Youth and Family Services, Malama Family Recovery Center, Somos Ohana Nicaragua, A Cup of Cold Water, Heifer Project, Neighbors Helping Neighbors, Imua Family Services, Episcopal Relief and Development, and more! Woodwork. There’s just something special about this medium. The warmth, the colors, the contrast – master woodworkers know how to make each piece truly special. Here’s a gift guide to some fun wood items, each made on Maui. Wood is the traditional five-year wedding anniversary gift, but I think these awesome finds below would always be appreciated. 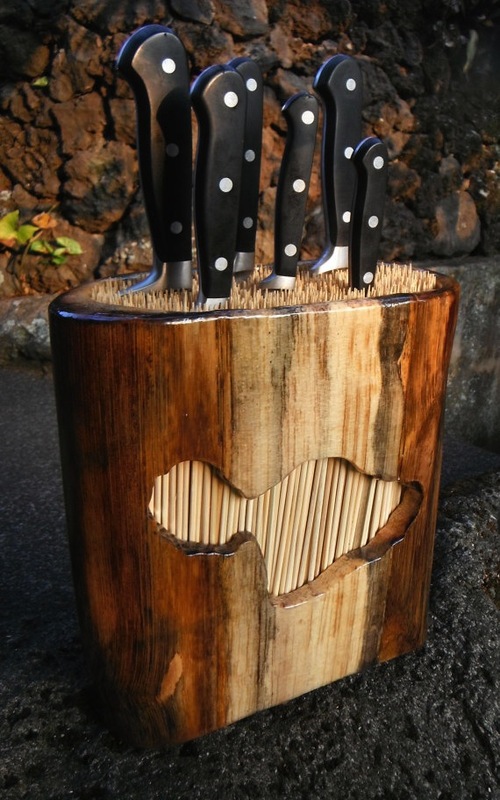 Wood-n’t this make a great wedding present for a Maui wedding? 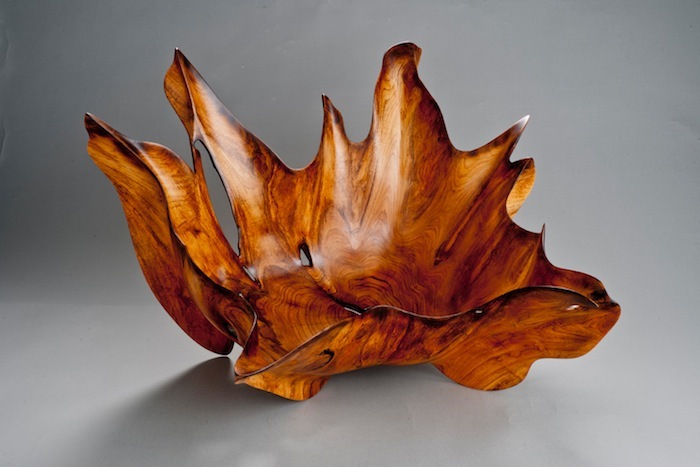 This agave wood knife holder, with the island of Maui carved out of the center, was made from wood that was sustainably harvested from the slopes of Mount Haleakala. An epoxy finish was used to add strength and to accentuate the natural beauty. Currently available on Etsy by DynamicElephant. 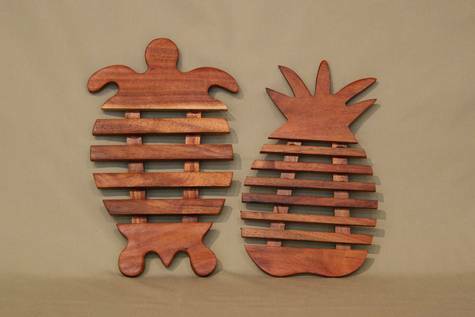 Hand-carved Koa wood turtle and pineapple trivets by Kamano Woods – view their artwork online at mauihands.com or at the several Maui Hands stores around the island. 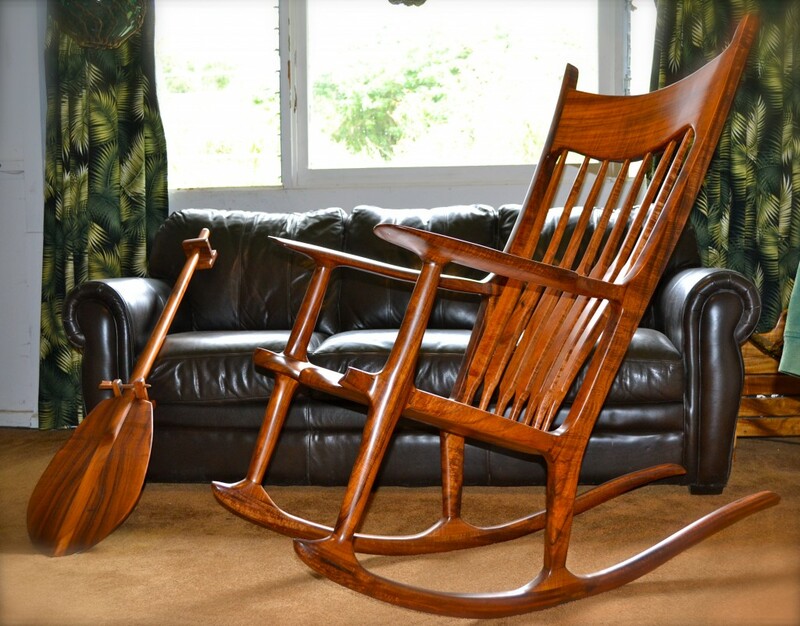 Made with old world techniques and oil glowing surfaces, this one of a kind solid koa rocking chair will embrace you with arms of comfort that no other chair can. Handmade on Maui by legendary furniture maker Randall Watkins, using only the finest vertical cut grain of curly Koa. Available online through the Rachael Ray Art Collection, or if you are on Maui, head on over to Makawao to try one on for size at Maui Hands. Wood Bead and Sea Shells – So Organic and Trendy! 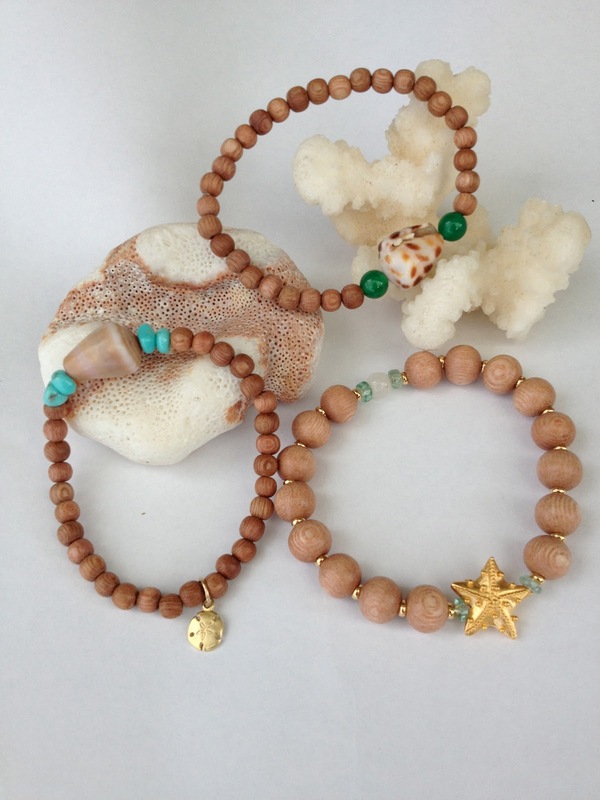 Wooden bead bracelets by Maui jewelry designer Valerie Dunn, with Maui seashells and charms. View more pictures on Valerie’s blog, and contact her for availability. Visit his website to see where Derek’s pieces can be seen, and which ones are available for purchase. For more than six years, the Smith Family has worked diligently on bringing Ocean Vodka from Maui to the international marketplace. The new upgraded facility provides Ocean Vodka control of all supply and production, with farming, distillation, manufacturing, marketing and sales consolidated for the first time since the brand’s inception. It also solidifies Ocean Vodka’s growing presence in the marketplace, supporting a ten-fold increase in business as well as new opportunities to expand production into rums, whiskies and unique, naturally infused spirits, while providing additional jobs for the local Maui community. To follow the Maui Made blog, you can sign up to get an email of new posts, or you can follow along on Facebook (click for direct link), if you already get too much email! There will likely be more shares and quick posts on Facebook anyway. Eventually, there will also be a more formal e-newsletter, directed to Hawaii-based and national media, to get some much needed exposure to all these incredible Maui artists, designers, and Vodka producers (ok, the vodka producers seem to have no problem getting press) and more information on how to receive that e-newsletter will be posted here on this blog.